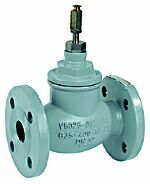 Pressure balanced control valve for closed circuit systems. For district heating; hot or cold water (max. 50% glycol), water quality VDI2035. Additional description Models DN15..80 approved according DIN EN 14597 (up to 130 oC), with motors ML6425A, ML7425A.